We will discuss about the different uses of animals. We know animals are very useful for us. We get many things from animals. Let us know some of the following uses of animals and the important things we get from animals. 1. Food: Some animals help us in obtaining food. (i) Animals like cow, buffalo, goat (she) gives us milk. Milk is considered as a complete food and it is necessary for growth and health. We get many milk products, which are prepared from milk for example ghee, butter, cheese, curd, sweets, etc. (ii) Some people use the meat of certain animals as food. 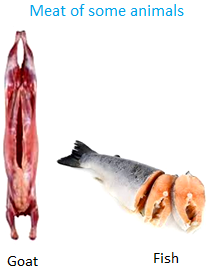 The meat of some animals is eaten like goat, sheep, pig, fish, deer, etc. The meat of some birds is eaten like hen, duck, etc. Hen, duck, etc and some other birds lay eggs. Egg is considered as healthy food which is rich in protein. 2. For transport: Some animals are used for carrying people or goods from one place to another. Bullock, camel, donkey, elephant, horse, etc. are such animals. Bullocks draw bullock carts. Camels draw camel-carts and in deserts they are specially used for used for conveyance and carrying loads. Horses and elephants are also used for conveyance. Animals used for Transport, Ploughing, etc. In old days pigeons and hawks were used for sending letters from one place to another. Bullocks are very useful for agricultural purposed. They are used for ploughing the fields and threshing the crops. 3. 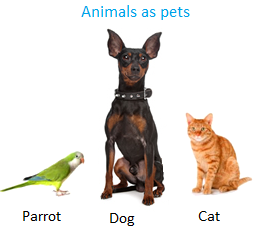 Safety and Recreation: Some animals and birds are kept as pets like dogs, cats, parrots, pigeons, etc. A pet dog guards our house and very faithful to its master. 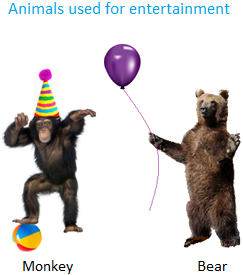 Some animals are also used for entertainment like monkeys and bears. Many kinds of animals such as lion, tiger, horse, elephant, etc. are also used in circus to entertain us. 4. Wool and Silk: Wool is obtained from the fur of animals like sheep, goat, etc and is used for making woolen clothes to keep us warm during winter season. Woolen yarn is also used to make woolen blankets and carpets. There are silk-worms feeding on mulberry leaves. These worms produce silk-threads which we get from cocoon. These threads may be dyed into different color to have colored silk-clothes. The hair of certain animals is also used to make brushes for painting, white washing and coloring walls etc. 5. Leather: When animals die, their hides or skins are taken out. These hides are coated with different types of chemicals and dried in sunlight. That gives us leather which we use to make various kinds of things such as belts, shoes, purses, bags, etc. Using, the ivory or outer teeth of elephants many beautiful decorative articles are made. 6. Honey and Wax: Honey is obtained from bee-hives made by honey-bees. Honey-bees also make wax which is used for making candles and honey is used as medicine. 7. Manure: Animal dung and bird-drop-pings are used for making manures. These manures maintain fertility of the soil.